In this spirited sequel, The Rook returns to clinch an alliance between deadly rivals and avert epic—and slimy—supernatural war. When Stiletto came for me in the mail, I just about died from happiness. I had just finished the audiobook of The Rook, and it was just about the best book I’ve ever read in my entire life. I laughed the entire way through it (O’Malley has a fantastic sense of humor), and the plot kept me absolutely riveted. It was, hands down, one of the best audiobooks I’ve ever listened to. So Stiletto came in the mail, and about ten seconds later I was reading it. Stiletto has a few differences that will be noticed right off the bat. Rook Thomas is all over the book, but she’s not a main perspective character. I think that was a really wise decision for the author to make. Rook Thomas is important. She set the stage in the previous book, but allowing in some other viewpoints allows the world to build and widen a bit more, and it was absolutely essential for the plot itself. Not to mention interesting, as one of the perspective characters is a woman in The Grafters who is sent to England to work with The Checquy. Another is a pawn for the Checquy and a few others drop in and out on occasion. The Grafters add an interesting viewpoint, because of the divide between the two organizations, so much of what happens in England, and in The Checquy is completely surreal and unusual to them. This sort of innocence and foreign lens really makes so much of what Rook Thomas accepted as fact, more…strange. On the other hand, you have a run of the mill pawn, who gets to see and experience some of these really strange happenings on eye level, which make everything that happens a lot more intimate and important feeling than it probably otherwise would have. So yes, numerous new perspectives were a smart move. The plot itself is just as fantastic as the plot in The Rook, and it takes off with quite a bang. It quickly becomes obvious that the weird happenings aren’t just standard weird, but something quite special. There are political issues, personal issues, and quite a bit of adjusting as everyone gets to know each other and learns how to work together. The antagonists are just as fantastic as everyone else, and the plot is full of twists and a ton of moments that had me laughing out loud. Part of what makes this novel so wonderful is the interaction between The Checquy and The Grafters. O’Malley takes the obvious discomfort between the two groups, and makes it not only uncomfortable for the readers, but also lends the book itself to some absolutely hilarious moments. That’s what I love so much about this author. Not only is the book well written, and an absolute riot, but it’s also laugh-out-loud funny, and takes awkward and tense diplomacy to a whole new level. It’s really delightful how easily this book pokes fun at just about everything, diplomacy included. In a serious world, it’s a breath of fresh air. There are plenty of side plots, most of which add to the book itself, but a few felt kind of frivolous and lacking in any real point, and occasionally felt like they distracted from the overall flow of the book. Regardless, it was hard to fault them when they were so well written and entertaining, and for my one complaint, it’s a pretty minor one that is incredibly easy to overlook. 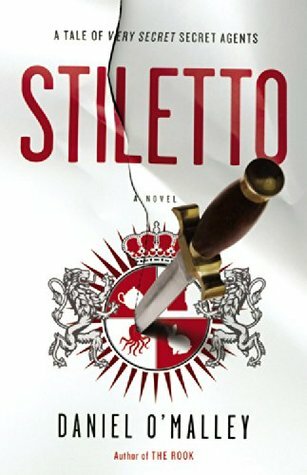 The Rook blew me away, but Stiletto was probably one of the best sequels I’ve ever read. It takes everything that was so incredible about The Rook, and builds on it. The plot is tight. The characters are fantastic. I absolutely loved to hate the antagonists, and the twists and turns throughout the novel kept me guessing without ever really predicting any of them. I was really, really sad it was over and I regret that I won’t have another chance to read either of these books for the first time all over again. This book drops on June 14. My suggestion is to get your hands on it right away, and if you haven’t read The Rook yet, you have two weeks to do so. You’re really missing out.